When you're looking for a stellar fire pit, Hearth Products Controls offers a dazzling solution with the 31" Fire Pit Insert with 24" Penta Burner with Electronic Ignition - 24 Volt. 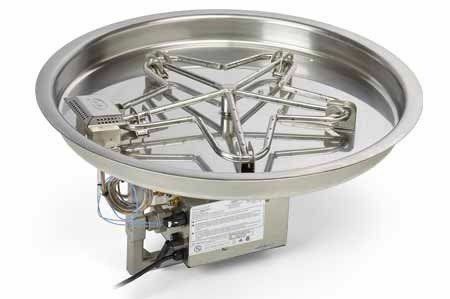 With a 24" star-shaped burner in a 31" stainless steel round bowl pan, don't let the appearance trick you � this fire pit has a maximum BTU output of 200,000 and is available for propane or natural gas. Dazzle friends and family with this fire pit from Hearth Products Controls.